Just when I thought that Purex couldn't get any better; I'm snapped back to reality. Purex has definitely exceeded my expectations with this new product. Honest! 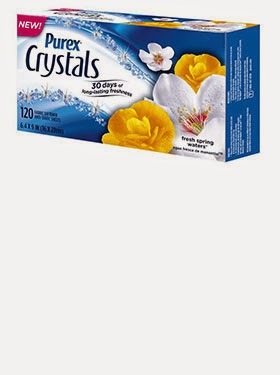 I couldn't be more thrilled with the NEW Purex Crystals Dryer Sheets. The new fabric softener sheets are available in two amazing scents. Fresh spring waters (Blue box), and Lavender blossom (purple box). *Toss a dryer sheet into your hamper. *Tuck dryer sheets into linen closets. *Freshen up your dresser by tossing a dryer sheet into a drawer. *Hide a dryer sheet under couch cushions. Each Purex Crystals Dryer Sheet is loaded with fragrance. Caution: The fragrance may be too strong for those who are sensitive to scents. I prefer my laundry products to be enhanced with a strong aroma. Stronger the better! This product definitely fits in with my preference. If you are in search of a laundry product with a strong, and lovely fresh scent, this product may be for you! Please remember that a product may be enjoyed by one person while disliked by another. The only con I discovered other than it may be sensitive to some was the boxes the dryer sheets come in. Most of the boxes in the store doesn't appear to be glued well. Even my sample arrived with the flaps open. To solve this issue, transfer your fabric softener sheets into a large Ziploc bag to preserve the freshness. Visit Purex on Facebook for product announcements, and contests! DISCLAIMER: Purex provided me with a sample of the New Purex Crystals Dryer Sheets. However, all opinions are my own and unbiased. Thanks, I liked this a lot. Awesome information, these would be great for the car, too!